کولائیان, علی, غلامی سفیدکوهی, محمدعلی, ضیاتبار احمدی, میرخالق, دادش‌زاده, حسن. (1394). مدل‌سازی و تحلیل عددی جریان تحت شرایط آبیاری جویچه‌ای. نشریه آبیاری و زهکشی ایران, 9(4), 665-677. علی کولائیان; محمدعلی غلامی سفیدکوهی; میرخالق ضیاتبار احمدی; حسن دادش‌زاده. "مدل‌سازی و تحلیل عددی جریان تحت شرایط آبیاری جویچه‌ای". نشریه آبیاری و زهکشی ایران, 9, 4, 1394, 665-677. کولائیان, علی, غلامی سفیدکوهی, محمدعلی, ضیاتبار احمدی, میرخالق, دادش‌زاده, حسن. (1394). 'مدل‌سازی و تحلیل عددی جریان تحت شرایط آبیاری جویچه‌ای', نشریه آبیاری و زهکشی ایران, 9(4), pp. 665-677. کولائیان, علی, غلامی سفیدکوهی, محمدعلی, ضیاتبار احمدی, میرخالق, دادش‌زاده, حسن. مدل‌سازی و تحلیل عددی جریان تحت شرایط آبیاری جویچه‌ای. نشریه آبیاری و زهکشی ایران, 1394; 9(4): 665-677. به منظور شبیه­سازی توام جریانات کم عمق روی سطح خاک و نفوذ به درون آن، معادلات سنت- ونانت بسط داده شد. با توجه به عدم وجود راه حل تحلیلی جهت حل این نوع معادلات، از این رو محققین جهت حل این مسائل روش­های عددی را پیشنهاد می­کنند. در تحقیق حاضر از بین مدل­های هیدرولیکی آبیاری سطحی مدل هیدرودینامیک کامل به دلیل شبیه­سازی دقیق جریان و از بین روش­های عددی دو الگوی عددی شامل خطوط مشخصه (HD-CH) و صریح لکس انتشاری (HD-LAX) برای گسسته­سازی معادلات حاکم بر آبیاری سطحی استفاده و در ادامه برنامه­ای کامپیوتری به کمک زبان برنامه­نویسی متلب تهیه شد. جهت ارزیابی روش­های عددی از چهار سری داده­های جویچه­ای استفاده شد، که این داده­ها از طریق آزمایش در مزرعه مورد اندازه­گیری قرار گرفت. هم­چنین روش پیشنهادی در شرایط یکسان با مدل هیدرودینامیک نرم­افزارهای SIRMOD و SRFR مورد مقایسه و اعتبار­سنجی قرار گرفت. یافته­ها نشان داد که هر دو الگوی عددی در شرایط جویچه­ای با دقت مناسبی فرآیندهای مختلف جریان را شبیه­سازی می­کنند. با این حال نتایج شاخص­های ارزیابی نشان می­دهد مدل HD-LAXبه واسطه روش حل دارای دقت مرتبه دوم است، و با متوسط ضریب تبیین، آماره­ی خطا و کارایی مدل (834/0، 36/1، 91/0و 815/0، 43/1، 88/0) به­ترتیب برای مرحله پیشروی و پسروی و خطای نسبی (44/7- و 8/19) درصد در برآورد حجم آب نفوذ یافته و رواناب، هم­چنین زمان محاسباتی کم­تر جهت شبیه­سازی فرآیندهای مختلف جریان جویچه­ای از دقت بالاتری نسبت به روش HD-CH برخوردار است. نتایج بررسی محاسباتی توسط روش پیشنهادی HD-LAX در مقایسه با روش­های HD-SIRMOD و HD-SRFR نشان داد که در مرحله پیشروی روش پیشنهادی و مدل HD-SIRMOD اختلاف معنی­داری ندارند در حالی که مدل HD-SRFR در سطح یک درصد با مقادیر مشاهده­ای دارای اختلاف می­باشد. In order to simulate shallow flowson the soil surface and penetration into the depth, the Saint-Venant equations were developed. Due to the lack of analytical solutionfor solving these types of equations, researchers generally suggest numerical methods as a solution.In the present study, from the hydraulic models of surface irrigation, the full hydrodynamic model due to its accurate simulation of the flow, and from the numerical methods, two numerical models, includingthe characteristic line method (HD-CH) and the explicit diffusiveLAXmethod (HD-LAX), were used to discretize the governing equations of surface irrigation. Afterwards, a computer program was developed using MATLAB programming language.In order to evaluate the numerical methods, four furrow data series were used, which were measured through testing in the farm. In addition, under the same conditions, the proposed method was compared with the hydrodynamic model of SIRMOD and SRFR softwares and was consequently validated. The perceived results revealedthat both numerical models simulate various flow processes under furrow conditionsatan acceptable accuracy.However, the results of the evaluation indicators demonstrated that the HD-LAX model, due to the solution method of the second degree of accuracy, withthe average coefficient of determination, error statistics, and model efficiency of (0.834, 1.36, 0.91) and (0.815 , 1.43, 0.88), respectively forthe forward and backward stages, and with the relative errors of 7.44 % and 19.8 %, has a higher accuracy than the HD-CH model,in estimating the volume of water infiltration and runoff, and it also needsless computational time for simulating different furrow flow processes.The results of calculations, through comparing the proposed HD-LAX method with the HD-SIRMOD and HD-SRFR methods, showed thatin the forward stage, the proposed method and the HD-SIRMOD model do not have any significant difference,while the HD-SRFR model, at the confidence level of 1%,has some differences with the observed values. عباسی،ف. 1374. استفاده از مدل­های کامپیوتری در طراحی آبیاری نواری، پایان­نامه کارشناسی ارشد، دانشگاه تربیت مدرس. Abbasi,F., Shooshtari,M.M., Feyen,J. 2003. Evaluation of various surface irrigation numerical simulation models. journal of irrigation and drainage engineering. 129.3: 208-213. Aminizadeh,M. R., Liaghat,A., Mahmodian-Shoshtari,M., Kouchakzadeh,S. 2006. An Explicit Scheme of Zero-Inertia Model Equations with Effectiveness of Wetted Perimeter for Furrow Irrigation Simulation. Water Agricultural research. 8.3: 1-16. Banti,M., Zissis,T., Anastasiadou-Partheniou,E. 2011. Furrow Irrigation Advance Simulation Using a Surface–Subsurface Interaction Model. journal of irrigation and drainage engineering. 137.5: 304-314. Bautista,E., Clemmens,A.J., Strelkoff,T.S., Niblack,M. 2009. Analysis of surface irrigation systems with WinSRFR—Example application. Agricultural Water Management. 96.7: 1162-1169. Bautista,E., Wallender,W. 1992. Hydrodynamic furrow irrigation model with specified space steps. Journal of Irrigation and Drainage Engineering. 118.3: 450-465. Bradford,S.F., Katopodes,N.D. 2001. Finite volume model for nonlevel basin irrigation. journal of irrigation and drainage engineering. 127.4: 216-223. Burguete,J., Lacasta,A., García-Navarro,P. 2014. SURCOS: A software tool to simulate irrigation and fertigation in isolated furrows and furrow networks. Computers and Electronics in Agriculture, 103, 91-103. Chanson,H. 2004. Environmental Hydraulics of Open Channel Flows. Clemmens,A., Strelkoff,T., Playan,E. 2003. Field verification of two-dimensional surface irrigation model. journal of irrigation and drainage engineering. 129.6: 402-411. Dong,Q., Xu,D., Zhang,S., Bai,M., Li,Y. 2013. A hybrid coupled model of surface and subsurface flow for surface irrigation. Journal of Hydrology, 500, 62-74. Ebrahimian,H., Liaghat,A. 2011. Field evaluation of various mathematical models for furrow and border irrigation systems. Soil Water Res, 6(2), 91-101. Elliott,R., Walker,W., Skogerboe,G. 1983. Infiltration parameters from furrow irrigation advance data [Modified Kostiakov infiltration equation, soils, Colorado farms]. Transactions of the ASAE [American Society of Agricultural Engineers]. Esfandiari,M., Maheshwari,B. 2001. SW—Soil and Water: Field Evaluation of Furrow Irrigation Models. Journal of agricultural engineering research. 79.4: 459-479. Gerald,C.F., Wheatley,P.O., Bai,F. 1989. Applied numerical analysis (Vol. 19903): Addison-Wesley New York. Hoffman,J.D., Frankel,S. 2001. Numerical methods for engineers and scientists: CRC press. Loukili,Y., Soulaïmani,A. 2007. Numerical Tracking of Shallow Water Waves by the Unstructured Finite Volume WAF Approximation. International Journal for Computational Methods in Engineering Science and Mechanics. 8.2: 75-88. McClymont,D.J., Smith,R.J., Raine,S.R. 1999. an integrated numerical model for the design and management of furrow irrigation. An integrated numerical model for thedesign and management of furrow irrigation, 6. 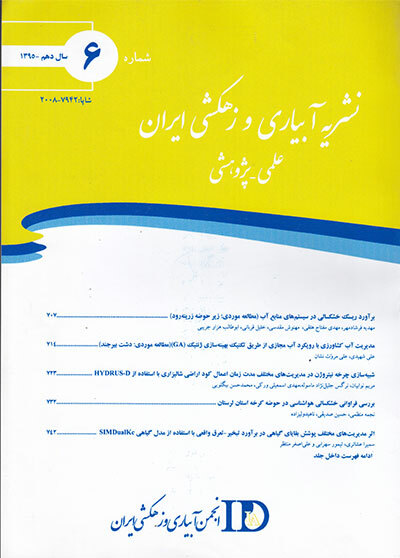 Moravejalahkami,B., Mostafazadeh-Fard,B., Heidarpour,M., Abbasi,F. 2009. Furrow infiltration and roughness prediction for different furrow inflow hydrographs using a zero-inertia model with a multilevel calibration approach. Biosystems Engineering. 103.3: 374-381. Irrigation.I: Model Development. irrigation and drainage engineering. Schwankl,L., Wallender,W. 1988. Zero inertia furrow modeling with variable infiltration and hydraulic characteristics. Transactions of the ASAE. Soroush,F., Fenton,J.D., Mostafazadeh-Fard,B., Mousavi,S.F., Abbasi,F. 2013. Simulation of furrow irrigation using the Slow-change/slow-flow equation. Agricultural Water Management, 116, 160-174. Strelkoff,T., Clemmens,A., El-Ansary,M., Awad,M. 1999. Surface-irrigation evaluation models: Application to level basins in Egypt. Transactions of the ASAE. 42.4: 1027-1036. Strelkoff,T., Clemmens,A., Schmidt,B. 1998. SRFR, Version 3.31—A model for simulating surface irrigation in borders, basins and furrows. US Department of Agriculture Agricultural Research Service, US Water Conservation Laboratory, Phoenix, AZ. Strelkoff,T., Katopodes,N.D. 1977. Border-irrigation hydraulics with zero inertia. Journal of the Irrigation and Drainage Division. 103.3: 325-342. Strelkoff,T.S., Clemmens,A.J., El-Ansary,M., Awad,M. 1999. surface-irrigation evaluationmodels: Application to lllevel Basin in Egypt. American Society of Agricultural Engineers. 42: 1027-1036. Walker,W.R. 2003. SIRMOD III Surface Irrigation Simulation, Evaluation and Design. Guide and technical documentation. Dept of Biological and Irrigation Engineering, Utah St University, Logan, UT, USA. Wallender,W., Rayej,M. 1990. Shooting method for Saint Venant equations of furrow irrigation. journal of irrigation and drainage engineering. 116.1: 114-122.